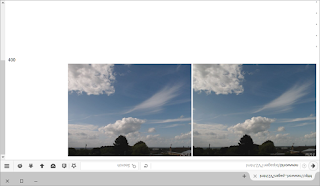 3D viewing of live data - or perhaps timelapse video sounded fun, and I especially wanted to have a go at cloud timelapse with extra large camera spacing - since I have a great view of the sky to the north from our house. While there is lots of content out there, and apps that do fake 3d from single photos (with much the same results as fake stereo from mono in the 1980's), there didn't seem to be much info about roll your own. Well after a few hours messing about and a lot of lessons learned things are looking pretty good. After a bit of judicious makery, here is a snapshot of the web page that displays live images from 2 webcams. This isn't proper video, this is 1 frame per second served up by motion and stuck into a single web page using some simple html that allows some tweaking. The reason for upside down and the html is all explained below. The webcams here are 2.3m apart. Displayed on an original Nexus 7 in Google Cardboard (painlessly extended to accept the larger device), this looks pretty good, although the screen door effect is blatant. The standard Google app is about a 'VR experience', but I am far more interested in a straight 3d image viewer - along the lines of the old viewmasters, So I am not expecting (so far!) any ability to track head motion. While there are a couple of 'ordinary' stereo image viewers around they only work with static images - not streams. Below is some detail on what I have done and how I have done it. 800 steps per second on multiple motors! Well I think this is about as good as it will get. The hardware is Pololu A4988 drive carriers controlled directly from Raspberry Pi io pins. The test software is some fairly straightforward Python code the uses pigpio to do all the donkey work. By increasing the power supply to 24v (after carefully setting up the current limiting on the Pololu boards) I can got to around 800 full steps per second with moderately good torque and stability. Faster rates do work, but torque falls off rapidly, and any real load stalls the motors quite easily. 75 - 80 steps per second. 260 - 280 steps per second. Better stepping with an A4988 based controller. I wired up a single stepper driver board today on a baby breadboard and after a lot of firkling about I have this running pretty smoothly using the pigpio library. I have been testing to see the maximum speed I can reach with this setup, and it comfortably reaches just over 400 full steps per second in 1/2 step mode (so I am kicking the step input 800 times a second. 1/2 step mode gives the fastest rotation and also has the most torque. All other modes tend to fall into stuck jitter well below 400 steps per minute. I am currently running the rig off 12volts. I am going to try 24 volts (with a suitable adjustment to the current limiter!) as this should give me a bit more speed. As described in an earlier post, this HAT is really only doing stepper motor control as an afterthought, so limited the step rate to just under 80 per second. However after rummaging around in the code while developing a driver for my telescope mount, I noticed that the Adafruit code is pretty basic and makes no attempt at optimisation. With some simple changes to the Adafruit code I have managed to improve the step rate to around 280 per second peak. This also means that there is less jitter in the pulse timing as well.